New Apple iPhone patent: could the handset become an underwater camera king? Apple's next big adventure: the deep blue sea. Apple has filed a new patent that looks to bolster the underwater shooting capabilities of the iPhone. Underwater photography is something of a sea change for Apple (sorry). But, if the patent becomes reality, it will be the latest in a long line of improvements the company has been making to the iPhone's camera. 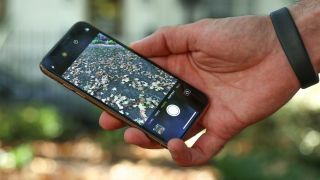 The iPhone XS had a number of camera improvements that showed Apple's handset capable of being a dedicated camera. Its bokeh effect, dedication to manual control and some fantastic portrait features certainly puts the phone up there in our best camera phone guide, with the Huawei Mate 20 Pro and Google Pixel 3. A push into underwater photography is an interesting one, though, and not really something anyone else is currently doing. The patent is titled: Submersible Electronic Devices With Imaging Capabilities, which we're sure is also the name of a band we once saw in Shoreditch. The patent is all about optimising for underwater photography, with the phone detecting when it is submerged and the shutter is pressed. When this happens, there's a number of things the camera and its sensor does: gathers light information, depth information, detect murkiness, figure out how far objects are and adjust the illumination, filter etc accordingly. But just knowing Apple is interesting in improving underwater photography is an exciting thing - let's just hope it's prepping bigger and better IP ratings at the same time.